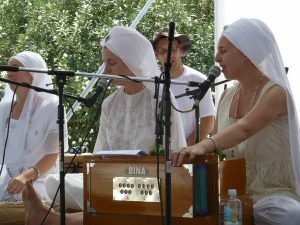 Sirgun Kaur is a sacred songstress and Kundalini Yoga instructor. Through the exploration of her music, and after her discovery of Kundalini Yoga, chanting, and mantra, she was led to an understanding of the transformative and healing potential of music. Sirgun believes that bodies and minds are malleable and miraculous. Her music is designed to put listeners in a state of natural healing. By listening and chanting along, the nervous system is soothed, the mind becomes less chaotic, and thus, one’s surrounding environment becomes less overwhelming. Through a gradual process of observing and listening to other chant artists, mixed with deep and personal songwriting experiences, Sirgun was led to this spiritual path through music.